Il est gonflé ce tweeter ! 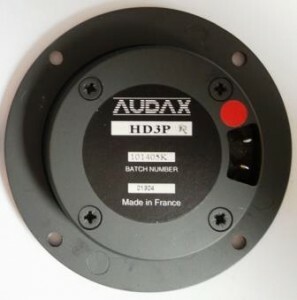 Le Tweeter HD3P Audax est un tweeter faisant appel à un transducteur avec une membrane PVDF (matériau piezo-électrique) avec une métallisation d’or, conçu par Gilles Milot. La membrane est juste gonflée à l’air et est effectivement sujette au dégonflage quoi que l’on fasse. Pour mesurer l’état du tweeter, poser la tranche d’une carte de visite sur la platine du tweeter en son milieu. Si la membrane touche en son sommet ce réglet (alignement sommet membrane avec la platine du tweeter), alors le tweeter est conforme. Si l’écart entre la membrane et le réglet est > 0,5mm => regonflage nécessaire. La conséquence d’un tweeter dégonflé est un signal affaibli (moins d’amplitude = signal moins fort). Et c’est très sensible ! Le SAV de LEEDH (Moca Audio) assure une légère transformation du tweeter. Il s’agit d’adjoindre une valve pour le regonfler! Ensuite, on peut procéder au regonflage soi-même en cas de besoin. Moca Audio fourni le matériel (une seringue) et le mode opératoire. Quelques possesseurs de Nazca changent pour un autre tweeter faute d’information … et pour très cher …. Quel dommage !!! Merci à Théo pour cette contribution. Don’t believe you’re speaking to the wall ! I wish you to stay tuned. It is my total conviction that all of Gilles Milot´s former works, big or small, still stands up against all competion even of today. They are so technically elaborate that many people ,even Leedhers, are not aware of how good in fact they really were/ are. At home I can still listen to my old Perspectives and then go to the latest HiFi show and still not get excited of what I get to hear there. At times I rather prefer listen to my old Perspectives over my Nazcas due to the inhabited musicality they have. Wood instrumenst aahh.. truly amazing! I bought my Perspectives new in 1980 but already then I have owned the Beveridges 2SW for two years, but I´m really glad I swapped them for Leedh! I have also owned the Aura1, Ether,Théorèmes, Starlets, Axioms, Flirt and Psyché´s.. Sure, I can show you all filters for each model and how they are made. No other speaker producer have got more attention from my part. So, should I not go for a pair of E2 glass now? No, I think enough is enough now. But Gilles Milot and his Leedh speakers are always the best! I agree totally! I’m a owner of Aura1 (a little bit « worked ».. ‘ shall explain and develop this later) paired with The two channel amplifier ‘n pré 1 …Electrocompaniet (Norway! of course…). Happy with them since year 74 for de latest and ’83 for the Aura’s. je suis tout à fait d’accord!!! Je possède des Aura 1 (un peu « traitées », je m’en expliquerai plus tard) couplées à, un Electrocompaniet 25W et Pré1( Norvégiens, bien sûr!) Heureux avec ces derniers depuis 1974 et les Aura 1983. La seule paire qui pourrait dépasser ces Aura (je ne les ai pas toutes écoutées!! ;): les Magico Q5-7 à un prix stratosphérique et pesant 2-4 X plus!! La même ABSENCE de son de coffret et de matériaux de membranes. Anyway, I hope this will help some Nazca/Ica owners having problem with deflated HD3P:s. See below site. So, are there no daring Nazca owners in this club? I checked my notes on the value on the capacitor that I mentioned would equal the HD3p in capacitance, it would rather be 15nF than 1nF. Sorry about that, but I guess no one has already had time to try it yet. If you don´t care to see or verify the technical bits just do the mod which it´s rather simple. And then give it a listen! on my Nazcas and observed that the signal that entered the very hi-impeeded and capacitive tweeter were clearly unstable and very sensitive to the outside world. This means that even you yourself (with your bodycapacitance) can provoke phaseshift in the signal path just by going by. I dont mean this is a real world situation and that you are going to be disturbed by such thing but it is very clear that this is happening at the test bench when fiddeling with it and without even touching it. 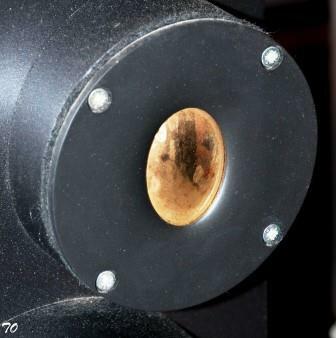 What CAN be disturbing though is the nearby midband filtering emission from it´s coils, but that is only a guess. You can first test this at your home lab yourself, and even without the tweeter itself, just insert a 1nF foil capacitor as a replacement for the hd3p, no resistor needed. THEN take a short insulated wire and connect from the Input – terminal to the Output(tweeter) +terminal on the smal transformer cirquitboard. This means that you now have short cirquited one transformer input-pole with one transformer output-pole, right. Ok, so what does this do, you´ll ask? The answer is that everything becomes totatlly stable and totally unsensitive to the outside world ! Nothing else is being changed as phase, amplitude or crossover frequency they´re still the same. And what does it do to the sound? To me it is totally obvious, much clearer and more strength to the HF-sounds. Note that this change would also and probably be possible on the Ica speaker but for them I have no experince. Good luck and hope to hear from You, daring Nazca owner!